Security around churches in Pakistan has increased since the deadly suicide blasts in Peshawar in September and the death of a police guard outside a church last month. On September 22, two suicide bombers blew themselves up outside the All Saints Church in Peshawar when congregants were leaving the church after the Sunday service. Ninety-six people were killed and 133 were injured. Then on November 19, a police constable, Muhammad Attaullah, was killed during a security operation outside another church in Peshawar. Samson Simon Sharaf, Central Defence Secretary of Peshawar’s provincial ruling political party, the Pakistan Tehreek-e-Insaaf (PTI), told World Watch Monitor that the Pakistan Ex-Servicemen Association is “providing security to 160 churches and it can be increased further”. Following the Peshawar blasts, the Pakistani police held meetings with church leaders in Christian areas, such as Bahar Colony in Lahore. Rev. Dr. Liaqat Qaiser from the Full Gospel Assemblies Church in Bahar Colony said that police were working alongside church members to provide security on Sundays. “The police instructed us to put barricades on the outside of the church, to keep the entrance clear and, rather than all the congregation leaving at the same time, worshippers should leave in small groups after the church ends,” said Qaiser. After the death of police constable Attaullah outside the Swati Gate Assemblies of God (AG) church in Peshawar, Deputy Superintendent of Police Fazal Wahid told World Watch Monitor that the incident had no religious dimension; rather that terrorists were attacking police everywhere. The church administration, however, did not rule out the possibility of another attack on a church and added that the church had employed security guards for a number of years. “The first time indiscriminate firing took place outside the church was in 2009, after which security has been permanently deployed,” AG General Secretary Dr. Arshad Masih told World Watch Monitor. He added that another police constable, Muhammad Shehzad, was killed outside the church on July 5. In Lahore, three men were arrested on October 6, after they were spotted at a wedding in St. John’s Catholic Church in Yahounabad. The men, Pashtoon in origin, were spotted by security guards, who noticed that they were outsiders to the area and asked why they had come to the wedding. When they could not provide a reason, they were handed over to the police. Locals say they have noticed Pashtoons (from the north-west region of Pakistan, bordering Afghanistan) moving into Yahounabad – one of the largest Christian settlements in South Asia – in recent years. They add that they are concerned not only by possible terrorist attacks, but also of increasing hostilities to the long-term residents, such as trying to manoeuvre them out of this prime area of the city, by buying up land. 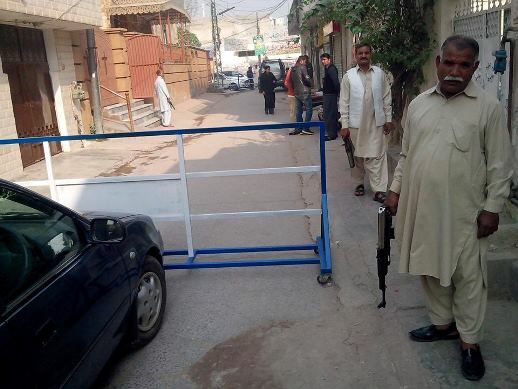 Meanwhile, local media reported that there were fears that the Lohari Gate Presbyterian Church in the Anarkali area of Lahore may be a target for terrorist attacks. PTI Defence Secretary Sharaf added that churches were one of the most likely targets for such attacks. “Christianity is seen as a symbol of Western cultural imperialism, which is why, after the Shiite and Barelvi [an offshoot of Sunni Islam] worship places, churches are the third target of hardliner terrorist groups,” he said.